Wow! A Ghost Story. Just Like I Pictured It. With Guns. And Everything. 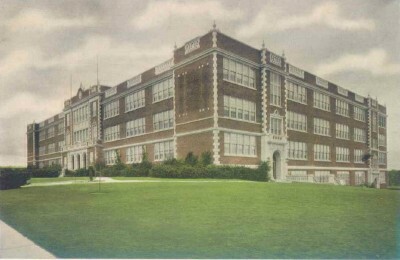 Byrd High School was built back in the 1920s. My mom graduated from the place, as I did, years later. Other than the addition of (some) air conditioning, I don’t think it changed one whit from her days. I haven’t been back recently, but when I taught there as a substitute briefly in the 80s, it looked just the same. It’s one of those WPA-style edifices that sits there as a testament to, literally “Old School” So it was with some surprise to find that the school supposedly has not one, but two ghosts. Ghost #1 is of little interest to the TTAG Armed Intelligencia. Supposedly, a girl drowned in the indoor pool, which was subsequently filled in. I don’t know about the ghost (I never saw or felt her) but when they built cross-town rival school Fair Park, the parents there wanted a pool too. The school board decided instead to fill in the pool at Byrd and convert it to a gymnasium. But the second ghost…aye, there’s a story. At one time, the Junior ROTC used to use the space as as shooting range. In those days, the J-ROTCies had a member of the military on staff as a faculty advisor, and rather than practice with guns that had been rendered harmless, they used the real thing. At least for target practice. Keep in mind, this would have been back in the pre-WWII days. Back then, kids that could drive would think nothing of having a rifle in the gun rack of their pickups, or even bringing a gun to class. Nobody frisked you at the door. Nobody needed to. Nobody would have conceived of things like classroom shootings, mass murder, or anything like what we have to put up with in our modern society. Guns were tools to be respected and used with care. They weren’t talismans of the Left. And they weren’t objects of fear and derision. As the story goes, Ghost #2 on the premises is the wandering spirit of the unfortunate ROTC advisor who somehow shot himself to death in the basement. Most ghost stories have it that he was distraught, perhaps over a lost love, and offed himself in the catacombs. Police reports from the era report that they did not find “suicide” as the cause of death, but left it as “accidental death.” One of the investigating officers said that he believed the unfortunate victim was cleaning a rifle he thought was unloaded, and found out the hard way that it wasn’t. A couple of observations on this story. . .
First of all, in all the time I was there as a student or as a sub, I never heard a word about either story. The Internet has apparently given new life to the tales. If I were to guess, I’d go along with the policeman’s hypothesis, that the instructor was the victim of an accidental discharge of the fatal kind. While accidents can happen to anybody, I’m not sure I’d have wanted someone that overlooks proper safety procedures to be teaching my kids about gun safety, if you know what I mean (and I think you do). Sad as any gun death may be, I’d chalk this one up to Darwinism thinning the herd and move along. So that’s my ghost story. Pretty scary, eh kids? No? Frankly, I think the idea of a gun instructor shooting himself (especially if it was an accident) is really scary. Much more so than any old ghost story you might want to bring up. Ghosts n guns? What a great combo! I’ve attended the Knob Creek Machinegun Shoot twice – when I stayed in Louisville I selected my hotel (Seelbach Hilton) for its haunted reputation, and something a bit odd did happen early one morning there. In addition, while in that area for the second time, I took a tour of the Waverly Hills Sanatorium, supposedly one of the most haunted places in the country. Nothing especially weird happened there to me, but taking the evening tour of the place was very interesting. I just watched the video, and these fools must think we’re all stupid. First they will ban all hi cap mags and then they will ban how many standard mags we are allowed to carry. These gun grabbers need to read on how HITLER imposed bans on his people, and they will soon learn what the entire world learned the hard way. I graduated from the City of Byrd in 1987, having transferred there from Huntington in 1986. The JROTC rifle range was located across from the cafeteria, would have been the northwestern corner of the building. We used .22LR rifles. Remington, IIRC, single shot rifles. MSG Huffman was the Rifle team coach then. Hi. The man you are speaking of if my grandfather William Stubblefield. He died early one morning while cleaning the rifles. His only son, my father was just 9 at the time. I’ve always been too it was accidental, and that he was the most precious man anyone could meet. In fact his grave reads, to know him was to love him. I had never heard of the school being haunted and our family has never experienced any type of hauntings.